A day that will go down in modern music history books as a day full of sadness. A golden star has finished shining brightly in the music world. Some in the Western Hemisphere might have never heard the Queen of Hip-Pop. But, many have in the Eastern Hemisphere world. That one person is Namie Amuro. It’s Japanese music week here on ☆ai love music☆! I swear it won’t be the case with the next post, I swear! 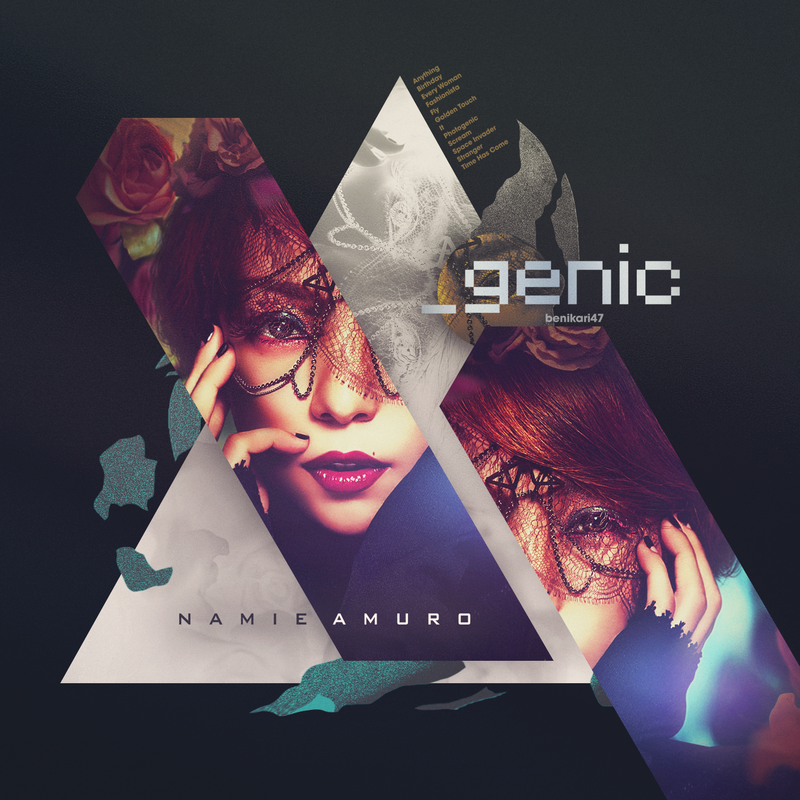 It just happens to be the week that the Queen of Japanese Hip-Pop and my idol, Amuro Namie, released her new album “_genic”. Has Amuro really had a dull moment ever in her career? I don’t think so. She has always dazzled many with her catchy “Hip-Pop” (a mix between hip-hop and pop) dance tunes, fashion trends, and her ambitions of always going forward. She continuously raises the bar every year in any avenue of work she does. And, that’s what I like about her. So, when Amuro announced that she was releasing a new album, I was really interested in what new concepts would she bring to the music world. One of the latest trends in Amuro’s music is worldwide influence. Over the past five or so years, Amuro has been singing more in English, recording in various international hot spots like Los Angeles and London, and started to enlist more non-Japanese producers to help create her songs. One example of this is a duet with French singer David Guetta on a duet version of his hit song “What I Did for Love”. Many have speculated that Amuro is getting ready for an American or even possible a Worldwide debut in the near future. Maybe it will happen or maybe not. Who knows? Even if she doesn’t get an American recording contract, Amuro Namie is still a legend whether you live in Japan or anywhere in the world. Before we jump off the bandwagon off with wild speculations, let’s come back and take a look at three songs from the new album, Even though the album didn’t feature any singles, it was heavily promoted on her official site and the video site Youtube with various videos. The first track showcased was “Fashionista”. The songs starts off with a strong start, featuring a baritone saxophone, an electric organ, and a fierce rhythm. But, what the song is lacking is powerful vocals. If you listen to the chorus, Namie’s vocals are weak enough for her to struggle through the song’s fierce personality. Maybe it wasn’t her or the label’s intention to have “Fashionista” be the “it” song vocal-wise. Instead, the song bows out to the stronger player, the music video, as it just focuses on Namie’s ethereal beauty as she wears colorful outfits in a black and white world and dancing in between yellow laser beams. “Golden Touch” is a perfect summer song that could be passed off as a distant cousin of an Ariana Grande tune. I do question Wikipedia sometimes and how it came up with the argument to classify this song as an “old-school “Beyonce–esque” R&B”. How can that be! Which song from Beyonce’s or Destiny’s Child’s discography does “Golden Touch” remind you of? Besides that, “Golden Touch” is a cool summer-y piece that doesn’t use electrical instruments too excessively. The bass section of the synthesizers are used perfectly as they accent the down beat of each measure. What also fits perfectly is Namie’s vocals. This is the type of upbeat song that can aid her voice and create a pure harmonization, especially when she hits the nasal sections. Sadly, I did not like the video at all. Sure, it did have a cool concept and stunning visuals. But, didn’t you get bored after a while, just having your index finger pointing to one section of the screen? I did. And, I really wished I could touch, or at least experience the feelings of touch, Amuro’s finger at the end of the video. Just touching a computer screen that has Amuro’s trying to touch your finger doesn’t cut it. The last song I want to talk about is “Anything”. When I was reading up on the numerous album reviews all over the internet, this one written on KPopBreak made me think a lot about this song when the author E.T. compared it to TLC. Because the author is right, it actually does! Doesn’t it remind you of “Unpretty“? Both songs feature lyrics of girl empowerment, using the same acoustic instruments, and similar melodic and rhythmic structures in the chorus. Hmm…. But I do have to give “Anything” some credit. It’s a pretty ballad with a strong message and got some great vocal action and decent English pronunciation from Amuro. Futhermore, ballads have always been Amuro’s strong point and “Anything” furthers that point with her soothing and strong timbre. The album features ten other songs that I will not review right now because I don’t have a lot of time to do a full, in-depth review. (It’s already 1 am here and I have work in the morning.) Nevertheless “_genic” doesn’t really impress me from what I heard on Youtube. It has some decent songs but it isn’t as memorable as her 2012 album “Uncontrolled”, which is one of my favorite modern-day Amuro albums. How did you enjoy _genic? 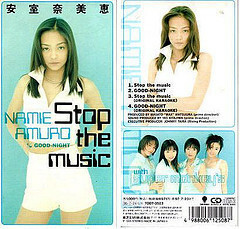 Do you think Amuro Namie has what it takes to release an album in America? The 2008 Best Five List! 2008 has brought a lot changes and upgrades to the music scene. We have seen a once all mighty Japanese producer fall harder and get blacklisted (ex. Tetsuya Komuro) and the world recession taking a crunch in the entertainment industry, even in the music world. But, to me, I remember 2008 as the year of reunions and change ups in the music world due to the reformations of many groups and the musical styles. We have seen the The Police and The Spice Girls break up finally in the Western World. But, in Japan, it’s a different story with reformation and reincarnation of many artists and groups like MAX and Chisato Moritaka. Thus, making this one of the main wheels in the Japanese music industry. Now before I start, this Top 5 list is what I think was the best thing to happen in the year of 2008. Now, I didn’t included somethings that were amazing to others because I didn’t believe they were amazing to me. For example, SPEED’s comeback. This new comeback is the third comeback thing they had did since they broke up in 2000. As much I love SPEED, this is just another planned comeback and isn’t so special to me. Also, their new sound in their songs aren’t as awesome like it was in the late 90s, when they were really popular. So why does WINK get the number five position if they only did one performance at the Japan Music Award ceremony yesterday? The reason why they are number five because they still influence today’s Japanese music scene. If you don’t who was WINK, they were an late 80’s to early 90’s Jpop duo that performed a lot of cover songs (about 90% of their single songs were cover songs, the albums had more of the original songs). They were so popular, especially in the late 80’s, that they even had stores with their products and goods in it (And, if you had store in Japan, it meant that you were super popular. Morning Musume. had a store like this when they were very popular during the Golden Era). Sadly, they broke up in 1995 after their single sales diminished a lot to only 5,000 copies for the last single. But, it’s not the sale numbers that counted they counted on for their popularity, it was their music style and how it sounded. Many decades after, WINK is still popular with the young crowd with reincarnations of the older hits (For example, Hello Project group W covering Samishii Nettaigyou). When you look at the clip above from the Japan Record Awards, you can see from the audience that WINK has touched a lot of the industry by their dance pop music, dancing (Who could never forget the routine to Samishii Nettaigyou? ), and the fashion. Without WINK, I think the Japanese music industry wouldn’t be as diverse as it and be more like the United States in terms of more of a hip hop and R&B-sounding pop songs. The dance music in Japan would rather more robust and wouldn’t have that variety. Also, they have helped the Eurobeat industry a lot (since the Eurobeat community is mostly in Japan nowadays). And without WINK, I think the Eurobeat industry would not be floating as peacefully in Japan (Remember, WINK did a lot of Eurobeat covers back in their haydays). In the later half of 2008, it was announced that 2nd Generation member Aki would be leaving MAX to pursue something else. Filling her spot was the return of Mina, the original lead singer of the group who left in 2002 due to having a kid. 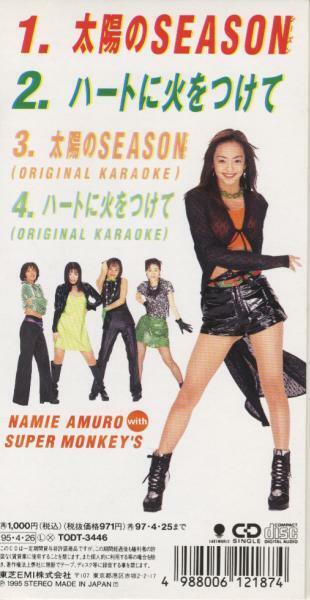 MAX is a popular Japanese group who debuted in 1995 after splitting from another girl group named Super Monkey’s (which Namie Amuro was also a part of). They enjoy smash hits tunes in the style of Eurobeat and were also known for their awesome dance routines. Many people have commented that Mina’s departure was the destruction of the group when she left the group in 2002 by cancelling of original albums, singles, and lowering the group’s sales and their performance stature. I partly think this is true because when Mina was in the group, the group had better vocals (not saying that the 2nd Gen MAX was worse but just how they put people on vocals irked me a bit). Also, it seemed that the original MAX had a lot more energy in their performances then the 2nd Generation MAX. Thus making it a really memorable performance to watch. But all in all, with Mina coming back in the group, I think MAX will be even better and be even more excellent in 2009. And, I hope avex would not let the fans down with not giving them new stuff to work with. To mark Avex’s 20th Anniversary, MAX Matsuura created a trio called GIRL NEXT DOOR that features the keyboardist from the band day after tomorrow, a guitarist, and a unknown dancer turned singer who was discovered last year in a dance club. They debuted in May online with a song that reached up to 2 million views by July. They debuted with a single in September and was nominated for an award by the JRCC. Big deal, right? HAL – You prolly heard of HAL’s works but have never heard of the name before. HAL is a duo that has composed many of late 90s to early 2000s hits like Ayumi Hamasaki’s songs, the original dream, and other avex artists. Many people best known HAL as the group that featured a female singer, was alive during 2000-2003, and featured many songs in different anime(s) like Hikaru no Go. The GND sound reminds me HAL’s sound because of the use of more piano-type instruments in the songs. DAI – DAI (real name is Dai Nagao) has been famous for composing songs for many of avex’s artists like Ayumi Hamasaki, dream, his own band (Do As Infinity), and other ones. Like HAL, GND’s sound reminds me of DAI so much because of the use of the piano and synthesizer in the group’s songs. Unlike HAL, GND’s uses the same composing and musical structures as DAI. For example, in the Girl Next Door’s song, Drive away, I could swear that there was a DAI influence in the composing and musical structure in the chorus (it reminded me of the same structure as Ayumi Hamasaki’s Fly High). Testuya Komuro – Lastly, the third person is the legendary TK who has been famous for bring the dance wave in Japan in the 90s. He was once the backbone of avex in the 90s and made a lot of artist successful during his reign as “Legendary Producer”. The artists that was under his guidance included globe, Ami Suzuki (when she was in Sony), trf, Namie Amuro, hitomi, Tomomi Kahala, and other acts. But in late in 2008, he was charged for fraud and a lot of his songs was pulled off the radio and globe’s material went out of print (which makes me sad because now I have to hunt down a lot of globe CDs through secondhand sites). TK’s sound is influenced in the GND’s sound by the element of techno in songs like Drive away. Though TK developed a more of a techno sound in the early 2000s, it was sorta popular among dance clubs and people altogether. But, it seems like that it made a mark in the avex music industry to have it be incorporated into the GND’s sound. One example, among many other examples, that I found a influence of TK’s sound is the instrumental ending at the end of the song Drive away. For anyone who doesn’t know Jero, he is dubbed in Japan as the “First Black Enka Singer”. He is from Pittsuburgh, PA and went to Japan after finishing college in hopes to become an Enka singer. He caught the eyes of the label Victor after winning many enka contests and finally debuted in Feburary of this year with the song Umiyuki. The single was a huge success, selling more then 200,000 copies, and winning him the award for Best New Artist at the Japan Record Awards. And to honor his late grandmother’s wishes, he will appear at the year end Kouhaku in a few hours. But why is Jero so popular and such a influence in the Japanese music industry? Because he influences the styles of the old and new into his music and style. The old is the style of music he sings (enka) and the new is the style of hiphop clothing he wears when he performs these enka songs. In Japan, younger generations of Japanese people are in love with the likes of Hiphop clothing and such. So by seeing Jero singing enka while wearing an hiphop style outfit, these people accept and think it’s really cool of what he does. By providing this type of style, the younger generation is starting to appreciate enka a lot more (before then, Enka was for the “old people” and it’s was sort of a dying business) and help revive a lot of the interest and the industry of Enka. Now, I am not saying Jero is only talented at wearing hiphop clothing but is also an amazing singer and inspiration to all those singers out there that anything is possible if your mind to it. Beside that, Namie has been semi successful since 2000 for her style charges (and her ups and down in real life and the music world). But, in 2008, Namie Amuro broke through when she released her single, 60s/70s/80s, by reaching number 1 on the weekly charts (which Namie has not done since 1998 with the single I Have Never Seen). Yes, she had success with her new sound with her past singles but I think that 60s/70s/80s helped Namie reached stardom due to the catchy tunes, the use of fashion, the style of music with each song/decade, and how her songs effectively used samples of popular American songs. And with these reasons, this why I think Namie is Number 1 in my choice of what was the best thing that happened in 2008 in the Japanese Music industry. Even if it was released last year, the theme song to the movie Gake no Ue no Ponyo has been very popular among the Japanese people in 2008. The popularity was achieved by two things: the cute little mermaid in the movie (which the puppet version has been very popular among the Japanese crowd and plus her story to fall in love with a human boy) and the eight year old singer Nozomi Ohashi (who sang with a duo called Fujioka Fujimaki). The song is very cute and contains lyrics about the little mermaid who is named Ponyo. The song is the theme song to the Hayao Miyazaki movie that has the same name of the song (which was released in the Summer 2008). It will be released in the states very soon, I hope. Enjoy this blog! I will hopefully write about what are my Top 5 discovery this year tommorrow or by Friday. I am having a bust week by watching Japanese programming, cooking for many people, applying to schools, and attending an all nighter for New Years (and trying to get some sleep afterwards).